For homeowners, business owners, and property managers, a fence is a great investment for many reasons. A privacy fence isn’t just a barrier between your property and the outside world – it’s a feature in its own right. There are several good reasons you should consider a vinyl privacy fence for your property. It shouldn’t come as a surprise that increased privacy is one of the chief benefits of a privacy fence. Vinyl privacy fences are perfect for enclosing your property and keeping out prying eyes, which makes them perfect for homeowners in suburban areas with houses that are close together. A quality privacy fence makes it easy to create your own backyard oasis where you’re free to do what you like. Privacy fences also make your yard safer for children to play in, and they prevent dogs from barking and howling at passers by. One of the best things about choosing a vinyl fence for your privacy fence needs is that you can make them as private as you want. Full privacy fences block virtually all sight lines between inside and outside, but they can also be ordered with open accents or in semi-privacy styles that allow limited visibility through the fence. No matter where you live or work, keeping your home or business safe is probably a priority for you. 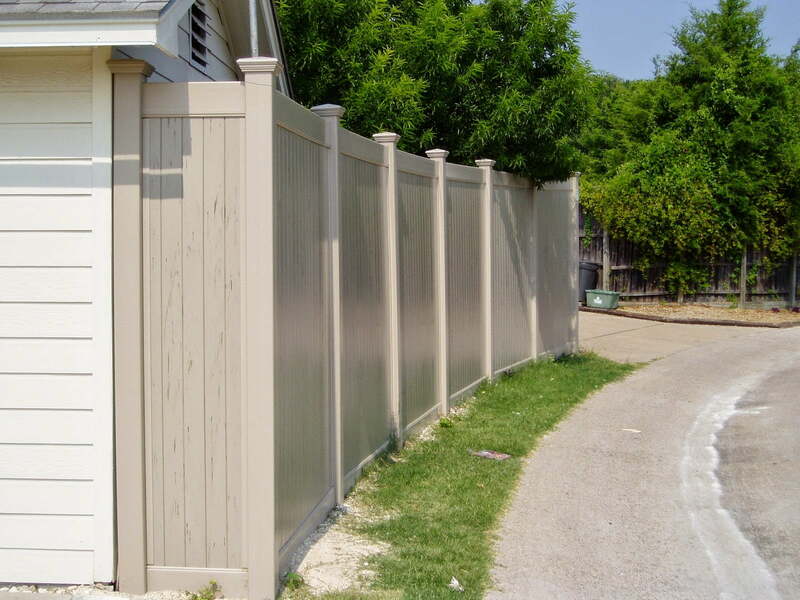 A quality vinyl privacy fence is perfect for increasing the security of your property. Along with strong and durable six-foot fence panels, vinyl privacy fences are also available with sturdy and secure locking gate options for increased security. Because of vinyl’s increased durability compared to wooden fencing, it’s the perfect material for a long-lasting privacy fence. And remember, a privacy fence doesn’t only secure your property from the outside – it also keeps things on the inside safe and secure, too. Your children and pets will be able to play safely and securely inside your fence without worry that they could escape. When you install a privacy fence around your property, it isn’t with the expectation that you’ll have to do it again in just a few years. However, if you don’t take care of a wooden fence at least every other year, you’ll find that it breaks down and weathers much faster than you’d like. In contrast, a vinyl fence will stand strong for years upon years – from 30 to even 50 years – without needing any maintenance at all beyond a simple wash with a garden hose. Plus, vinyl privacy fences stand up to difficult conditions like wind, hail, and ice storms better than wooden fences do. Unlike a wooden fence, a vinyl privacy fence never becomes waterlogged and never rots or warps due to temperature and humidity changes. That means your vinyl fence will last far longer than a comparable wooden fence, with far less maintenance. Along with all the other reasons, a vinyl privacy fence is a great investment for your property because it holds its value better than wooden fences. Since it lasts so much longer and it’s so much more durable, vinyl fences cost much less over time than wooden fences do – especially when you factor in the costs of staining and repairing a wooden fence over time. Vinyl fences add value to the properties they’re on, too. If you’re trying to sell your home, a vinyl privacy fence is a big plus to many potential buyers. They’ll see it as a maintenance-free solution that won’t require lots of repairs and replacement down the line. When you buy a vinyl fence from Future Outdoors, it comes with a lifetime warranty on the material from the manufacturer, and that warranty is one-time transferable to a new homeowner. If you’re interested in learning more about vinyl privacy fences and why they’re a great option for homeowners and business owners, contact us today at Future Outdoors®. We’re the top provider of vinyl privacy fences and other vinyl fencing and shade structures in the Dallas-Fort Worth metro. Call us at (972) 576-1600 to set up your free vinyl fence estimate, or follow us on Facebook or Google+ for more helpful tips and information.